Every desirable and beneficial gift comes out of heaven. It’s about time I talk about bikes again. Remember Artemis, my Seven Alaris? The top picture is what she looked like shortly after I bought her in October 2008; the bottom picture is in January 2008, her winter look. Compare that original style to what she looks like now. Your keen observational skills will notice that she went from pretty badass, especially in the winter, to just plain pretty. She started off ti with black and red; now she’s ti and pink. 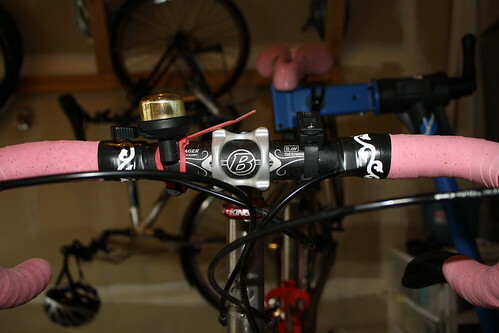 Today I swapped out my old black bar tape for the new, free, PINK bar tape I got on my trip to CBS with Dad on Friday. That’s right, the last holdout of black* on Artemis has succumbed to pink. I even used some fun swirly reflective tape on top of the black finishing tape. And you know what? Since I started pinkifying Artemis, I’ve gotten more compliments than ever on her style. Guys, by and large, tell me how good she looks. Seriously! I can’t remember all the admiring conversations I’ve had about her pink coloring. Last spring, I had a (cute) guy in a convertible pull up and say, “Hey, nice pink fenders,” before driving on. I trust he was talking about my bike. Anyway, I like that as a pink bike, she’s not just your standard black-and-red, which everybody has**. She’s unique, but no less tough for being pink. And it takes guts to ride a pink bike, as the Soft Like Kitten guys will confirm. 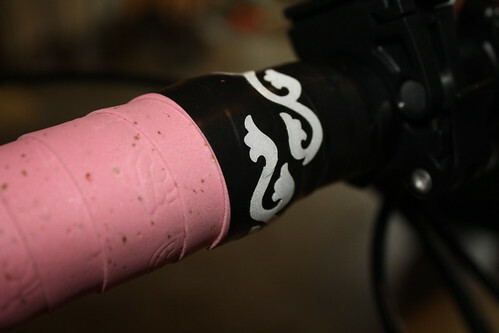 Of course, I really just do it because pink on this bike makes me happy. * I know, the bottle cages are still black and red. I want to replace them, but I can’t justify buying new ones when those are perfectly functional. 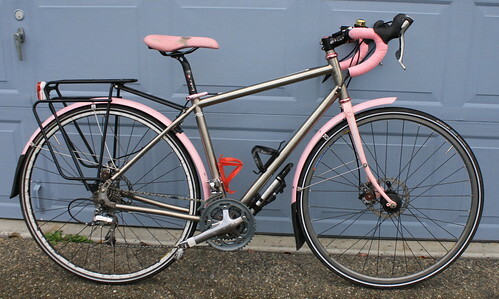 Almost all the pink conversions, excluding the fenders, have been extremely cheap or free. I also would like to get a pink-and-black Lazer helmet (the Genesis or Helium), but again, my blue-and-white one (which was also free) is still perfectly good. Christmas gifts, anybody? ** For example: Here, here, here, and here, just to list a few. Our tenure as long-term house-sitters! Tonight is our last night house- and cat-sitting for one of my coworkers; we spent a full week at her house this time, but had three other 2-night stints before that. This experience has confirmed that we are most definitely not cat people. My bike languishing unrepaired! Yesterday I took Artemis to Elliott Bay Bicycles. They’re building me a new front fork, something steel, sturdy, able to handle fenders, disc brakes, and harsh treatment. I’m so excited to get moving on the repairs at long last! Wrangling with Hertz and Oracle! Yesterday I also talked to Hertz, and they’re writing me a check for about $1,400 for repairs, plus paying for the cost of a rental bike as long as my bike is out of commission. The check amount is right between the two estimates I got, so I consider that pretty fair and reasonable. It may not cover the full cost of repairs, but I’m also improving my bike a bit at the same time, which will somewhat increase the cost. KDOG craziness! Next Tuesday, exactly 1 week, is the all-important City Council meeting that we wanted to spread door hangers to advertise about. A few people have volunteered to help distribute door hangers, so they’re getting spread around a little bit. I feel OK about how that’s going. Nobody has RSVP’d for my meetups (here and here) on Saturday, and I may cancel them, but that’d be all right because they are getting out other ways. All in all, I’m feeling much better. I’m working on a comprehensive volunteer handbook for the Bicycle Alliance; I put off more house-hunting until the middle of next week; and a few KDOG door hangers are getting out. All the believers were together and had everything in common. Selling their possessions and goods, they gave to anyone as he had need. Every day they continued to meet together in the temple courts. They broke bread in their homes and ate together with glad and sincere hearts, praising God and enjoying the favor of all the people. And the Lord added to their number daily those who were being saved. Yesterday hurt, in all manner of different ways. My car-bike collision injuries ached worse than on Sunday, and the longer I spent sitting, the worse I felt. Then, too, the “cold” I contracted on Saturday night turned into an evil beast: I hardly slept on Sunday night, between the bruising from my fall and my congested nose. 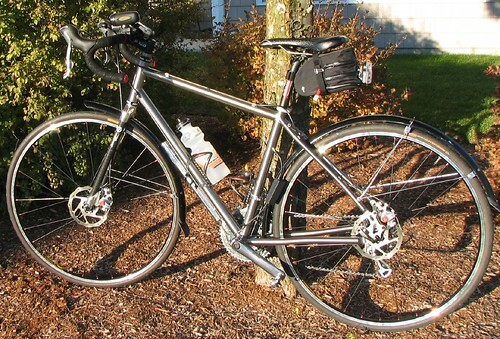 For the first time ever, I commuted to the Bicycle Alliance completely without a bike. I took the bus and walked, which hurt, of course. As the day wore on, my bruised hip became increasingly painful, my head throbbed, I kept accidentally leaning on my bruised elbow, my nose ran, my eyes felt hot and scratchy, and I ached all over. By 2:00 in the afternoon, after having struggled through a minimal amount of work, I threw in the towel and caught the 255 back home. Most of the bus ride I spent with my eyes closed, trying to not feel my aching head and body. When I got home, I curled up in front of the fireplace and didn’t move for three hours. By evening I had spiked a fever of 101 degrees and felt even more miserable than earlier in the day. I crawled into bed early, sent Ian to the store for NyQuil, and went to sleep early. About 10:50 I woke up drenched in sweat, took a shower, and went back to sleep. I don’t think I actually completely woke up for that shower, and I know for a fact that Ian didn’t wake up at all. This morning I woke up feeling much better, but decided that, after the Monday misery, I would do well to stay home and rest. Turns out I actually haven’t rested much: I worked remotely for at least 4 hours, plus Ian and I drove my bike down to Pedal Dynamics to get Dean’s estimate on repair costs ($990). I left the bike at Gregg’s Cycles for a third estimate, which I’m assuming will come in right around $1,000 as well. This afternoon a guy from Hertz called about the “incident” on Saturday. We talked about it a little bit and he asked if he could record my statement for the record. I agreed. He proceeded to ask me specific questions, which I answered as truthfully as I could in as much detail as possible. I told him exactly what I would have told the police, if they’d asked, and what I’d tell anybody else. I now have his name, phone number, and email address, which gives me a handle on Hertz. He said he would take care of all of the Hertz end of things. I agreed to email him copies of all the bike shop repair estimates, provided him with the phone number and case number for the Bellevue Police Department, and the (incorrect, as it turns out) medical report information. The EMS medical incident report form really confused me. It’s a carbon copy of the form, and the guy who filled it out didn’t press down hard enough on 90% of the form, including the part where it says “Agency:” The form doesn’t say anywhere else what emergency medical response team it might have come from, and I couldn’t remember if I’d gotten it from the EMTs or the Fire Department, or which city either had come from. Some confused phone calls to the Bellevue Fire Department records people sorted it out: Bellevue Medic 3 responded, but since I didn’t have to go to the hospital, they left. It was Redmond’s Fire Department EMTs who treated me on the scene, and they’re the people who actually have the medical report I want. I called them, but nobody answered — which seemed odd — so I left a message. This entire process is sure gonna take a long time, if only because of how hard it is to get all the paperwork in place. Come back in a month and I’m sure I’ll feel the same way, but more so. Oh, and Ian’s job interview? He got an offer. Which he’s taking. We are super excited about that great news. Sure enough, I feel like I was hit by a truck. Actually, I suspect I can attribute a significant portion of the feeling bad comes from the cold that moved in yesterday evening and the fact that this generally isn’t the best time of month (so to speak). For the record, my aches and pains amount to this: Standing up, putting socks on, or any other activity requires using the thigh/crotch muscles in my left leg or bending my left hip tend to be particularly agonizing. Also, my shoulders and pecs feel like I did a tough workout a couple days ago. My back and neck ache, as does my head, although that I can definitely place in the cold’s camp, blame-wise. I have a deep, black bruise on the inside of my right thigh where my leg smacked hard into the frame; a zip tie on the frame punctured my leg right in the middle, and there’s no bruise there, interestingly enough. And, of course, my left elbow remains swollen, extremely tender to the touch, and lightly contused, although I suffered no significant road rash. In fact, all of these injuries match up almost exactly to the injuries I sustained in my last fall, when I slipped on ice in February 2008. Thinking about it, I think that the car never actually hit me personally. Its bumper was right at shin-level, and I should have had some sign of impact there if it had hit me. Instead, my front wheel shows significant sign of impact — it’s slightly tacoed. I think the car hit my front wheel and knocked me over, and that all my bruises and scrapes came from that fall, not from the car actually touching my body. I’m so, so grateful that guy didn’t wait a fraction of a second longer in turning (although another minute would really have been best, to just let me by altogether), because I’m pretty sure something would have broken in that case. Now I start the fun, fun process of trying to get my bike fixed. The Kirkland Bike Shop did a quick ‘n’ dirty evaluation of the bike and suggested that $1,000 would cover all the repairs. 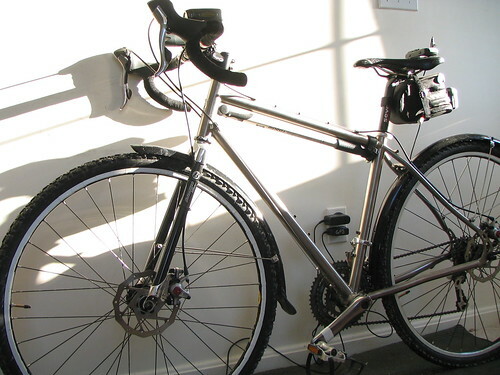 He recommended replacing the handlebars ($400), the front fork ($300, although it’s possible Bontrager doesn’t make them anymore, which could be a problem), and of course the bent wheel ($200), plus labor, new bar tape, and other miscellaneous small parts like spokes. I’m going to have at least one other bike shop give me an estimate, and get itemized estimate printouts from each shop for the insurance company… whichever one that may be. Insurance will certainly be the big issue here. This morning I called Hertz and found out that the driver had already started the claims process, a good sign. I couldn’t actually talk to any useful Hertz people on a Sunday, but the nice lady on the other end did give me a couple numbers to call during normal business hours. Then I called Oracle; the security guard on duty gave me the number to call on Monday as well. So now I’m calling the driver, Hertz, and Oracle tomorrow, in that order. I just want my bike back in one piece. Guess it’s good I have the Xtracycle to ride in the meantime! I was T-boned by a car while riding my bike in Bellevue today. Today is gorgeous. I mean just beautiful: Low 60s, sunny, light easterly breeze. The kind of day when Artemis just begs me to hop on and go for a long, luxurious ride. Who am I to resist? After Ian and I finished the morning of theology class with our church (a topic that deserves a whole nother post all on its own), I changed into bike clothes and left from the pastor’s house in Bothell. I rode out to Paradise Lake Road and it was so wonderful, and I felt so great — better than I have in weeks on my bike, strong and not struggling at all — that I decided to extend my ride. Instead of going home on 124th, I turned onto the Sammamish River Trail and hooked up with the 520 trail in Redmond. I planned to zip up through Kirkland (I was really looking forward to the flight down Northup Way, too), turn left onto Juanita Way, go over that hill, and come back home either on Simonds Road or via the bike path and Waynita Way. It was gonna be a fabulous ride. Occasionally Mt. Rainier peeked out; the sun felt warm, the shade cool, my legs strong, and I felt like I could just keep going forever. I might have actually executed my plan if, at the intersection of 148th AVE NE and NE 29th Pl, a contractor for Oracle driving a Hertz rental car hadn’t turned left into me as I went straight down 148th. I was in the right-turn lane, but towards the left-center, because I wanted to not turn right there but turn onto the bike path immediately across the intersection. Traveling about 19 miles an hour, I didn’t even have time to register that this guy was turning until I saw his hood right there on my left. Next thing I knew, WHAM! I’m up on the hood and then down on the ground. Everything went downhill from there. The driver got out of the car immediately and started urging me to get up out of the street. People were talking to me, other cars were honking, drivers were asking me things, the driver and his wife were trying to move me and my bike out of the way, and I was just feeling incredibly confused and shaky. I refused to move for a while. Eventually, when I ascertained that nothing seemed that awfully painful, I picked myself and my bike up off the road. The driver pulled his car into a nearby apartment complex parking lot, somebody called 911, and I started limping me and my bike over there. That’s when I noticed the front wheel was tacoed — not horribly, but it will definitely have to be replaced. At that point I stopped worrying about myself and started worrying about my bike: I can’t afford to replace the bike or most of its parts. Which shows my priorities may need readjusting. But I felt OK, for having just been in a collision with a motor vehicle. Anyway, we sat for a while and a guy brought me an ice pack for my extremely bruised left hip (I assume that’s where I impacted the car hood, there and my left elbow) and somebody else called 911. The driver and his wife, both from India, begged me not to make the collision sound too bad. The driver said it was nobody’s fault… and I didn’t disagree verbally, although any left-turn collision like that is a fairly straightforward case of failure to yield right-of-way. Turns out the driver saw me but thought I was going slower than I was, and decided to zip in front of me, or at least that’s what I gathered. I called Mom, who immediately dispatched Dad and Ian. While I waited for them, the Fire Department arrived and started palpating my neck, back, and head, all of which seem fine. Then the medics arrived and talked with the firemen and took over. They didn’t seem overly concerned about me since I had been able to walk from the intersection to the nearby parking lot. They asked if I wanted to go to the emergency room, and I eventually decided no: Last time I crashed on my own I got rushed there and was perfectly fine, except for the $700 bill. Now Ian and I don’t have that kind of money lying around, and I wanted to avoid it if I could. So the medics left after giving me an ice pack for my elbow and a hospital blanket. I’d started shivering badly between the ice pack on my hip, my right leg (the inside hit the frame of my bike, I think, and is fairly painful when I stand up), elbow, and all the shock. After the medics left, the firemen hung around and filled out a medical report until the police officer and Dad and Ian arrived. They were probably also making sure I didn’t suddenly pass out or start acting really weird or some other indication of brain injury. The police officer took a report and gave the driver and me a copy of each other’s contact information. The driver has an Indian driver’s license. Huh. Then we loaded my poor, battered bike and my poor, battered self into Dad’s car and went home. Now I’ve taken ibuprofen and have ice packs strategically placed on my extremities. Tomorrow it’s gonna feel exactly like I was hit by a car. Frankly, my biggest worry continues to be my bike. I’m young and very fit, and this was almost as mild as a car-bike collision could have been. I’ll have to get a whole new front wheel and helmet for sure, possibly a new front fork since that’s carbon fiber and probably is cracked, possibly a new rear wheel, and (oh goodness) new carbon fiber handlebars. I shudder to think of the cost. I just am PRAYING my titanium frame is OK. My fear is that the driver, who at one point said, “This wasn’t anybody’s fault,” won’t or can’t pay to fix the damage. But my sense is these guys don’t have any money; it’s going to have to be their insurance company. I can’t afford to fix all the stuff that might be broken. But I’ll save my panicking in that area until I can have a couple bike shops check the bike out and assess the damage, and until I start working with the driver and Oracle’s insurance company. Because of course the driver was insured through Oracle and was driving a rental car. I really, really wish I could have just finished my beautiful day ride as uneventfully as I’ve completed all my other rides for years.